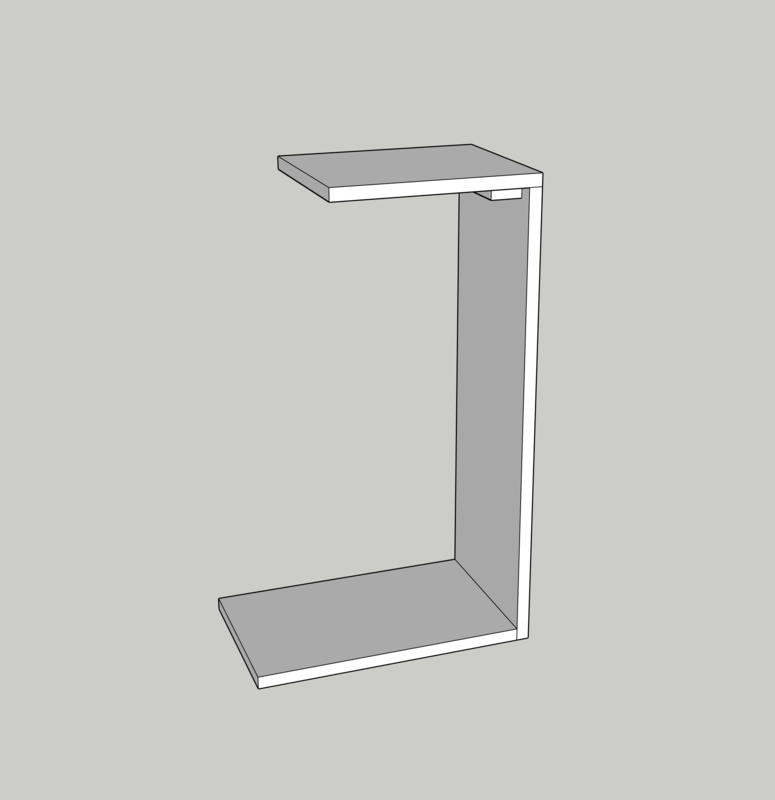 This post will teach you how I made a DIY space-saving sofa end table, including the build plans. 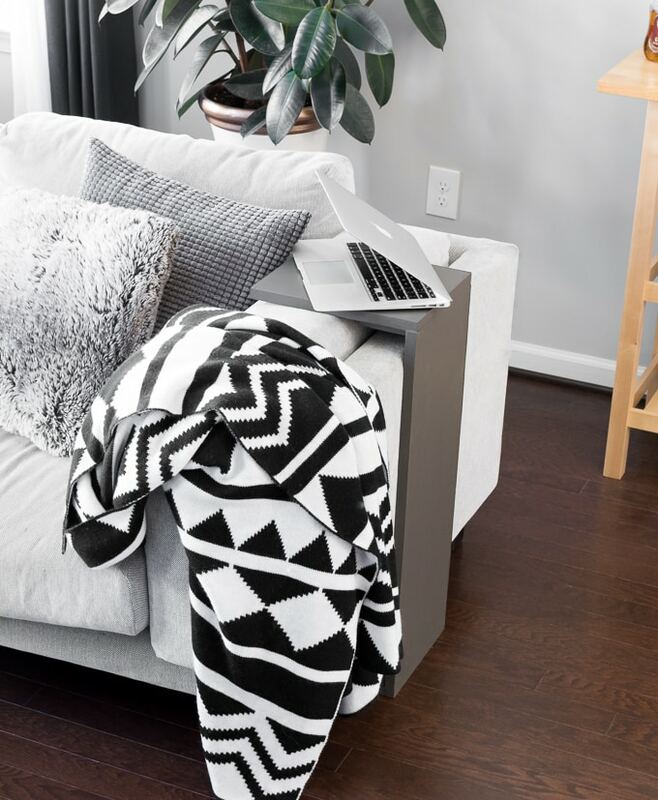 It is the perfect table for your laptop, remote, or drink. 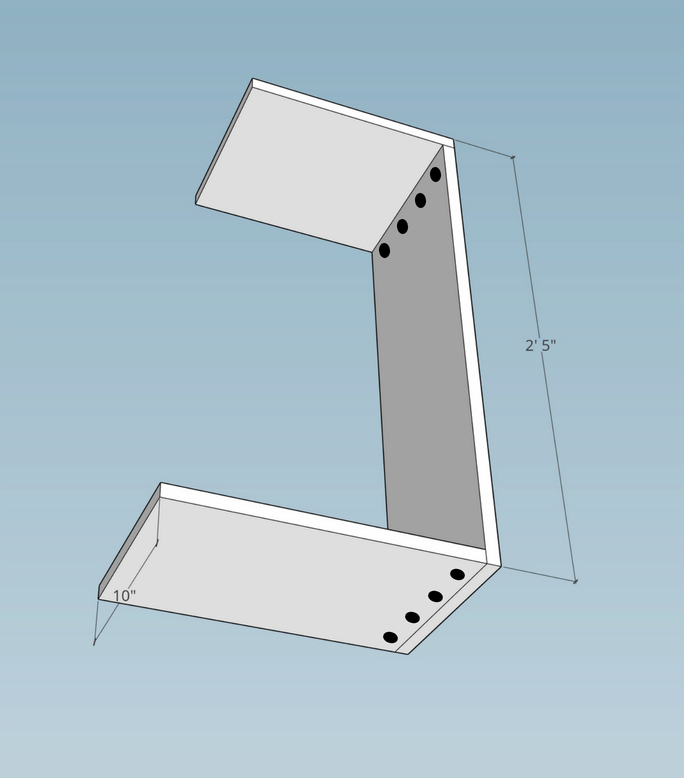 This project is featured in 30 Builds to Put Your KregJig to Work. Hiya folks. 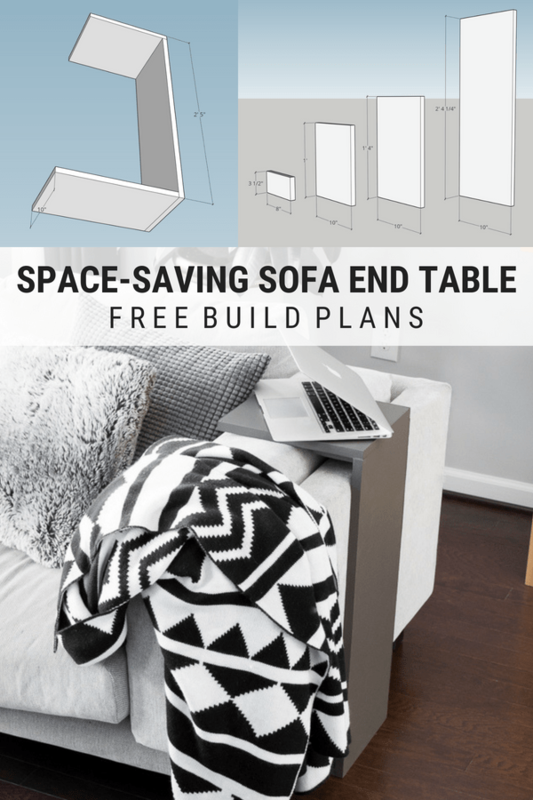 Today I’m sharing the build plans for a quick-and-easy DIY space-saving sofa end table. And if I built it in an afternoon, you know I’m not lying about the quick-and-easy thing. I have wanted to make one of these tables for a long time. 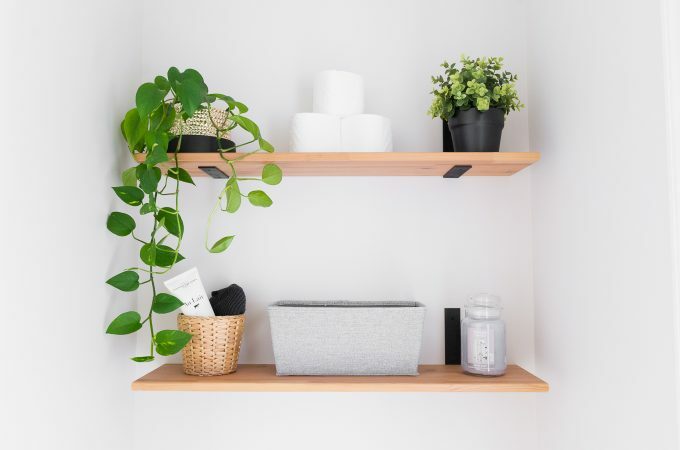 They are pretty nifty, and I’m all about space-saving functionality. 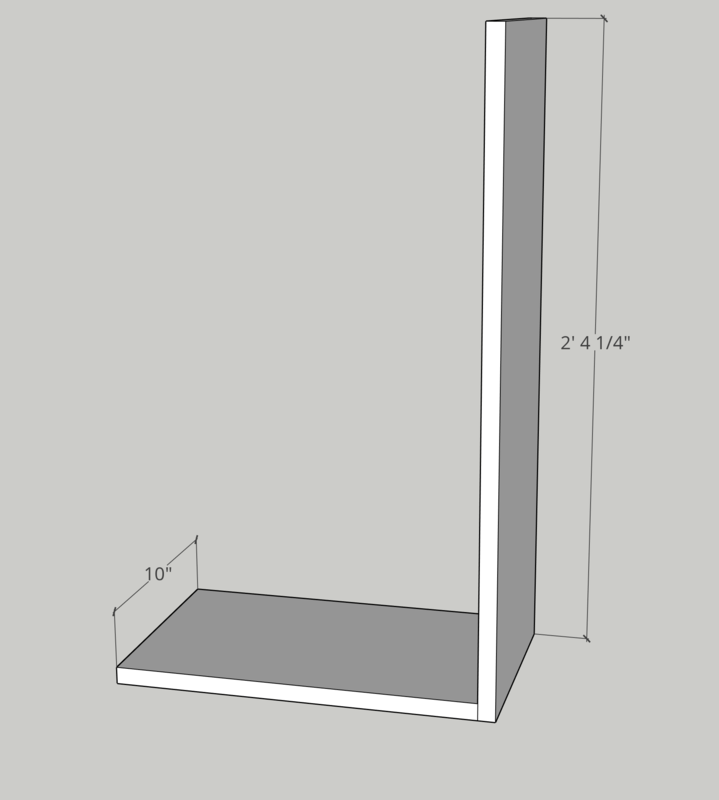 I also wanted to practice my SketchUp skills with planning out a real project, and when I realized I had enough plywood and iron-on veneer tape in the garage from our DIY murphy bed build, I dove in! Step 1: Prepare each piece. I used my circular saw to cut all pieces according to the cut list below. Then I used my orbital sander to polish each piece (lower grit first, then a fine grain to finish up). Next I used the KregJig K4 to drill pocket holes as outlined in the cut list below (black ovals). I also chose to attach my iron-on veneer edging before assembling the piece, but it could be done after, too. 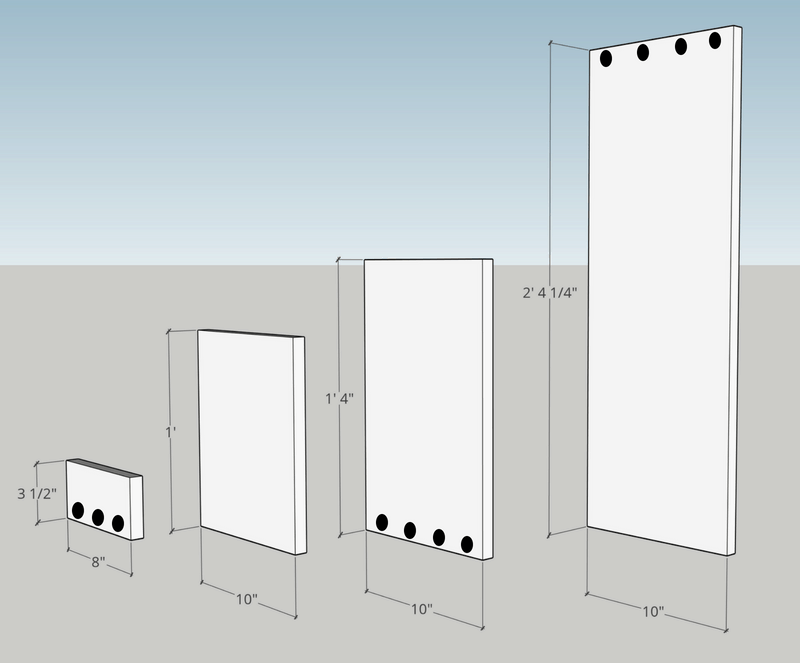 I used my drill to drive four 1 1/4″ pocket hole screws through the 10″ x 1′ 4″ piece, attaching it to the largest piece. The pocket holes on the 10″ x 1′ 4″ piece are facing down toward the ground so they will be hidden (see view from below pic). 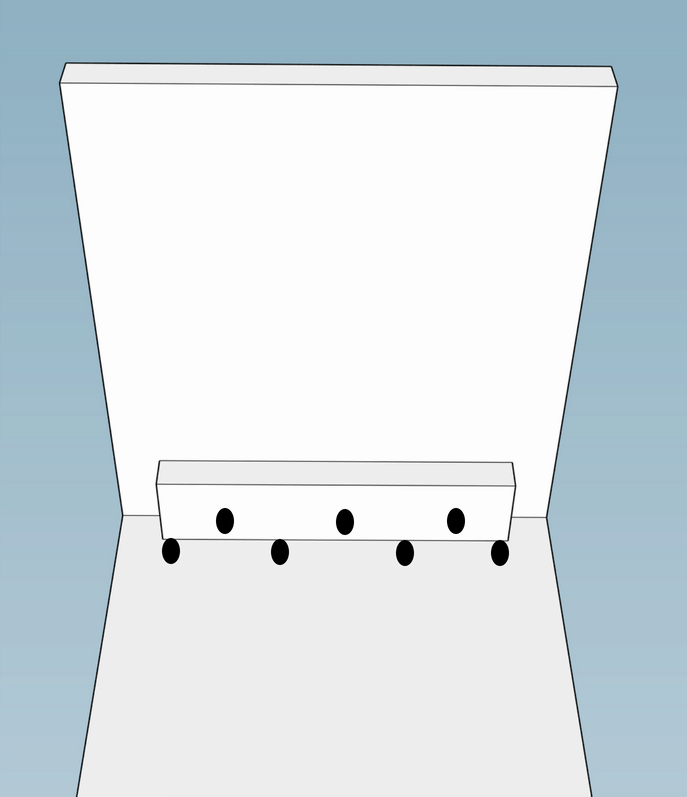 The pocket holes on the largest piece should be facing in and be located at the top (see step 3). I attached the 10″ x 1′ piece to the top of the vertical piece by driving four more pocket hole screws up through the pocket holes pictured below. Step 4: Add support piece. 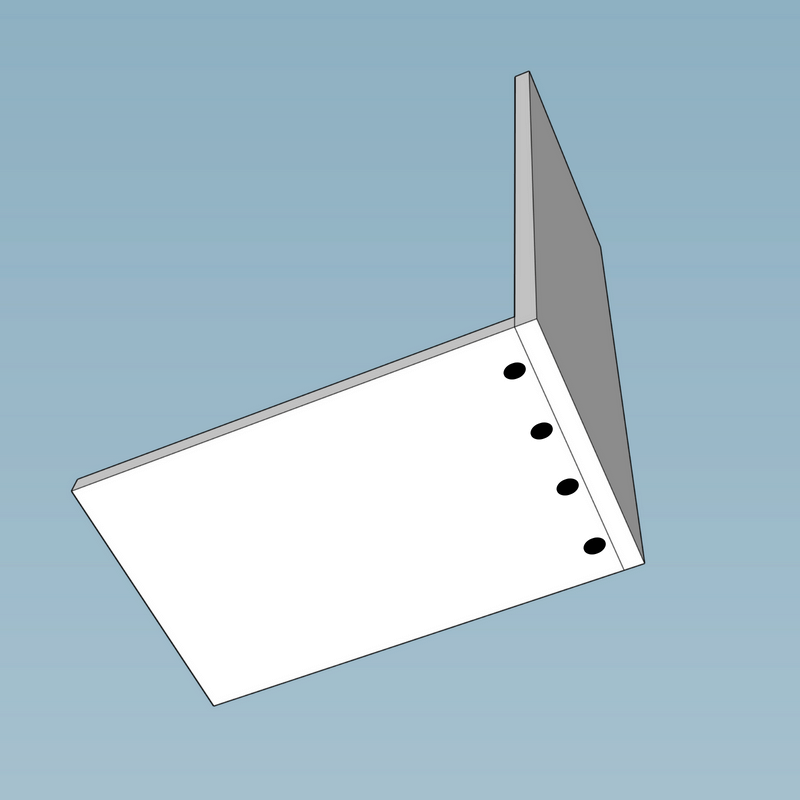 To finish off the build, I added a support piece—the 8″ x 3 1/2″ piece that has three pocket holes in it. I have seen this sort of table made with just the top, side, and bottom. But I wanted to add an extra support piece in mine so it fit my couch better. 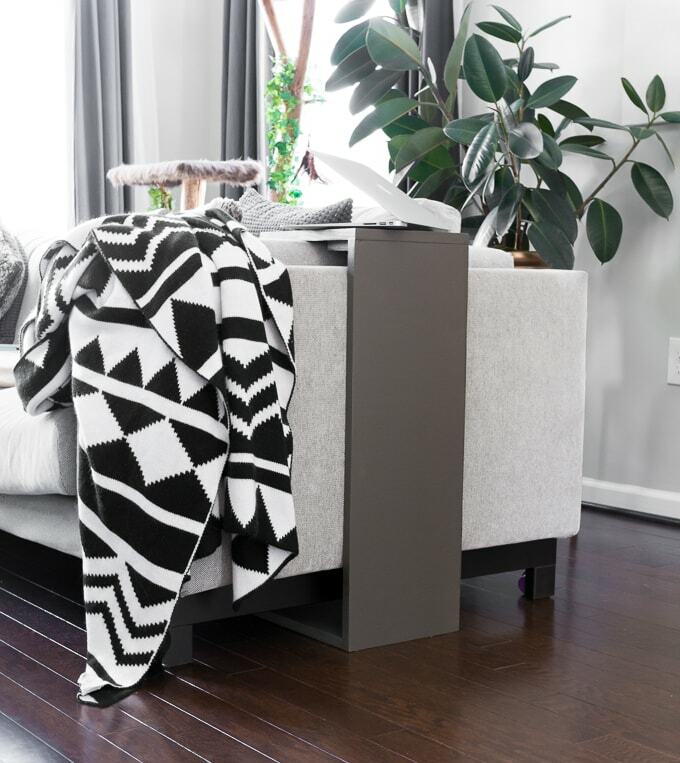 Although this piece isn’t meant to support much weight, and it will fit snug around the couch’s arm, better safe than sorry with added support. I stuck this piece snug into the inner corner of the table and attached it using three pocket hole screws. Here’s what the final piece looks like! I used Dap Drydex spackle to patch the visible pocket holes since I knew I’d be painting the piece, not staining it, and I didn’t have any wood filler. Then I gave it a coat of primer—oil-based primer is some nasty stuff, but it’s best to avoid a water-based primer with working with plywood since it can raise the grain. 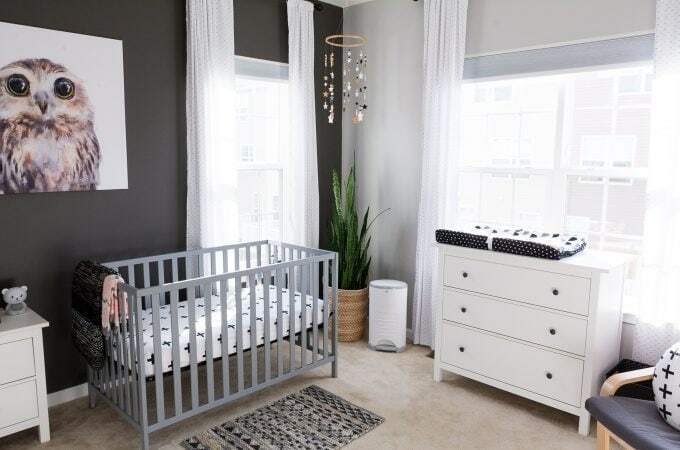 I painted it with one coat of the deep gray I had left over from the accent wall in Ramona’s room, Dark Granite by Behr. And I finished it with two coats of polyurethane since I had a feel this would be a high-traffic piece (what, we spend a lot of time on the couch…). And I bought nothing for this! Isn’t it great when you can come up with a project using only supplies you have on hand? Felt good to get rid of some of the plywood left over from the murphy bed build! 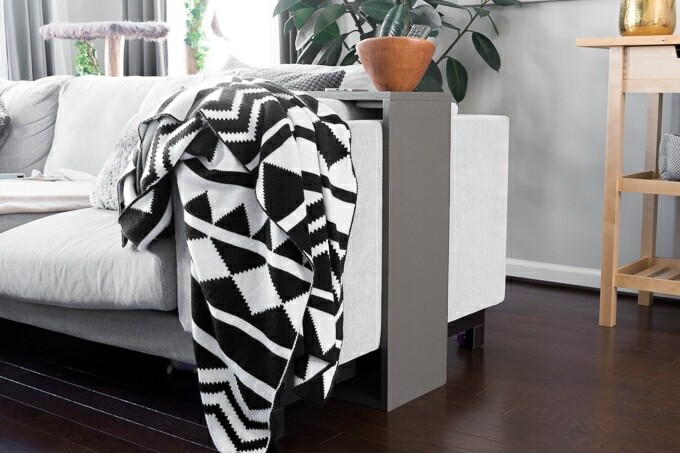 Of course the measurements in this post are specific to my couch, but if you wanted to replicate this project, you could just tweak the measurements so it fits like a glove on your couch. 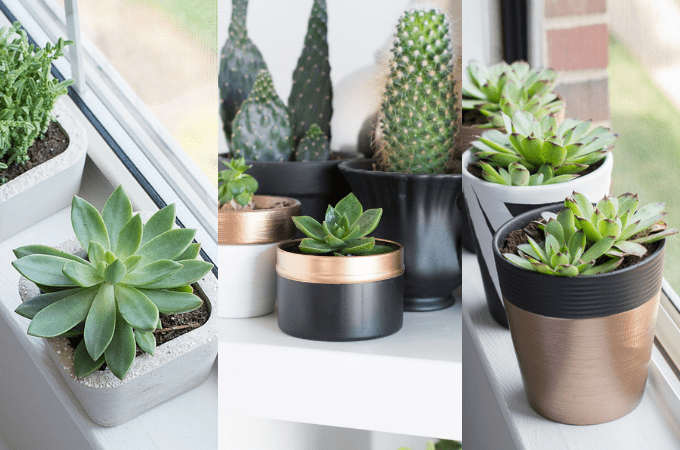 Thank you for sharing this easy, step-by-step guide, this is a great idea for small rooms!